There's no perfect balance; no prescribed fulcrum for the teetering boards that all of us are. Is there? We're all different woods, different weights, different spans of length. I feel so much and so deeply, sometimes, it is actually frightening to me. There is such beauty in some of the feeling -- like Emily Dickinson experiencing poetry, "feeling as if the top of [her] head were taken off" when she read a great poem; like the overwhelming "high" I feel when I hear a profound moment in music. Sometimes, though, the feelings come in cold waves. Sometimes, they are like weighted lines tied to all of the sinking things around us. Around me. 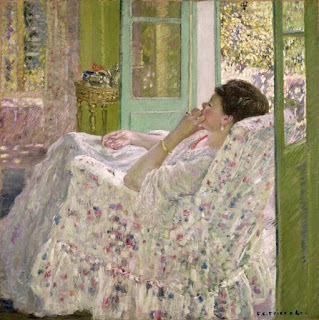 "Afternoon -- Yellow Room," 1910. I want to feel... I really do. But sometimes, feeling is like adrenaline: after a day on the roller coasters, the rides are just exhausting bacause the tank is empty. And sometimes, feeling is a joy that terrifies. It always leaves me exhausted, though. And sometimes very sad. Thank you! And thanks for that beautiful quotation...very, very true and it works for both the mind and the heart.